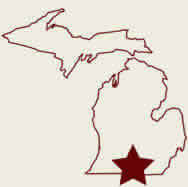 Our local cake boss is a professional baker who can create a custom cake for your Michigan wedding reception. Find a picture of your perfect cake on the Internet, and it can be recreated to your specifications. 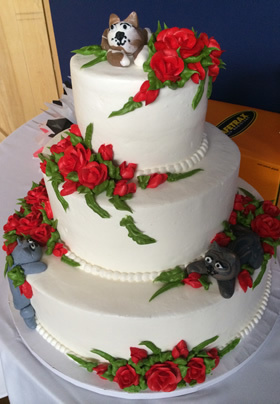 The cake will be designed to feed a full wedding party. A typical cake is one or two layers that will feed about 20 people. We have created traditional cakes with frosting beads and flowers, individual cupcakes, and masterpieces with candy and fruit. Your imagination and inspiration from the Internet can help you decide on your perfect cake design. One of my favorite custom cakes had multi-colored polka dots and a ribbon made of fondant over white frosting. One of the more unusual “cakes” was made entirely of chocolate-covered strawberries and candy bars. 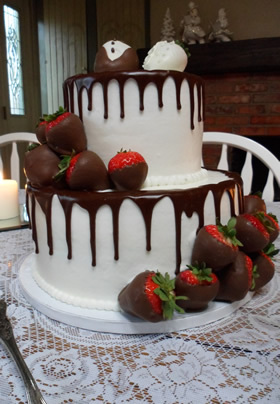 Our signature cake topper has a white chocolate-covered strawberry with beads for the bride and a white and dark chocolate covered strawberry with buttons for the groom. Simple or unusual, we can create a great cake just for you on your special day.